A walk through IKEA for me is like cutting a kid loose in a toy store. I want one of everything - from furniture to bedding to dishes. I also can't resist grabbing things as I head through the kitchen area. There are always fun and reasonably priced gadgets and utensils. Europeans are extremely focuses on efficiency and it's fun to see the space saving products throughout the store. 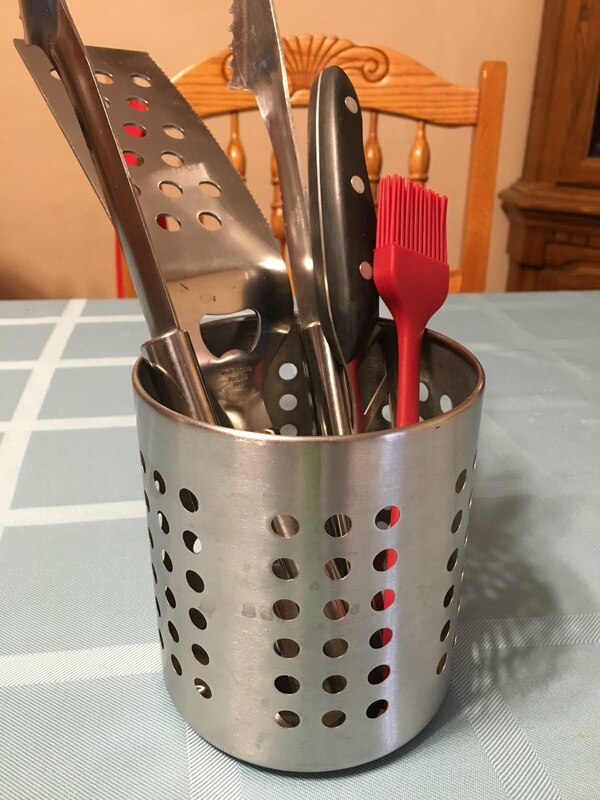 I grabbed a couple of these stainless steel utensil holders. With the large collection I have, I have a full overflowing drawer in my kitchen full of spoons and scrapers and spatulas and tongs. This fits neatly in the corner for the extras. I also grabbed one for hubby's outdoor man cave. He now has one beside the grill filled with stainless tongs, knives and brushes so they're always at his fingertips as he cooks.